ExDigita provides many essential services companies need to create, maintain, and market web sites and Internet-based businesses. Our outsourced services can be used for one-time tasks or for ongoing projects. For example, a company might want to use one of our tech professionals to substitute for an employee going on leave for a few months, or to fill a gap for a few months while a new person is being recruited and trained. Or, a company might need one of our tech professionals to work a certain number of hours per week. Some companies use ExDigita to plan, build, maintain, and market their web sites. For clients with ongoing needs for continuing full-time staff such as web developers, programmers, tech support staff, AdOps, SEO specialists, researchers, content writers, and others, and if the client wishes to manage the staff directly, we offer Virtual Staffing services. Managing affiliate network operations can be very tedious and time-consuming work, including recruitment of new affiliates, review of affiliate applicant web sites, welcome messages and promo messages to affiliates, checking affiliate compliance with policies, etc. We have experts in affiliate network operations that can handle all these tedious tasks for publishers, advertisers, and agencies. Our Google Analytics reporting service saves agencies and advertisers much time and effort. One of ExDigita’s core services is brand safety and compliance monitoring. Our well-trained compliance staff makes sure that ads comply with the ad policies of publishers, networks, and exchanges, and that web sites comply with the policies of advertisers, networks, media agencies, and exchanges. We also conduct FTC audits to make sure publishers and affiliates comply with FTC regulations for paid placements and affiliate links. Brand safety has become a major issue in the online media industry worldwide. You may think that your brand is being fully protected and your advertising or publisher policies are being fully complied with. You may think you’re safe running ads with a major media platform, a major network, or a major media agency. You might be very surprised to see some of the many problematic ad placements and non-compliant ads or sites ExDigita’s trained compliance team has found. Many paid placements and affiliate links do not have proper FTC disclosure statements, which can result in significant fines. ExDigita has found serious compliance issues on almost every media exchange and network, including those claiming to be completely “brand safe”. Our compliance experts constantly find potentially brand-dangerous media placements placed by major media agencies. How is ExDigita able to constantly find serious compliance issues involving undesirable ads or web sites that some of the largest and most famous players in the online media industry have failed to find and stop? We don’t just rely on technology or campaign settings to do compliance, as others do. Compliance is labor intensive work, and, to be done correctly and thoroughly, it requires expertise, knowledge, and attention to detail. We have a team of well-trained technical staff combing the web every day, making sure ads, affiliate links, and web sites comply with our clients’ policies and with FTC regulations. Our campaign managers are among the best in the industry at setting up, managing, and optimizing campaigns. Yet, our campaign managers cost 90% less than campaign managers in most clients’ home countries. We can provide campaign managers to work any hours, any days. Many companies constantly check their competitors web sites for price changes and promotions. Our trained online market researchers are adept at handling these kinds of research tasks, freeing up clients’ staff to focus on higher value-added work. Just tell our team what you need done, give us your daily or weekly reporting format, and let us save you time and money by handling your online research and analysis tasks. Regrettably, web sites are constantly under attack by hackers and spammers deliberately trying to disrupt site operations by uploading spam or other undesirable content. Some site users knowingly or unknowingly upload text or images that violate sites’ content policies, and which might damage a site’s reputation and goodwill with users. ExDigita provides detail-oriented content moderators, who know how to enforce sites’ content policies and keep out undesirable content and spam. There is an old saying in the media industry: “Content is King”. This is now more true than ever before considering changes in Google’s search algorithms, de-emphasis on links, antipathy to recycled content and article “spinning”, and a focus on original content. Writing and editing original content takes time and money. Our content writers and editors provide quality content in excellent American English at a fraction of the cost of creating content in major English-speaking markets. Publishers typically achieve revenue increases of 50 – 100% when changing from waterfall to header bidding monetization. But header bidding can be quite daunting and engineering-intensive to set up. We offer a turnkey solution that helps publishers implement header bidding quickly and painlessly. The Managing Director of ExDigita is an internationally acknowledged media expert who has been buying media around the world for 25 years. ExDigita’s AdOps professionals plan and buy online media for major international advertisers, as well as for smaller advertisers and entrepreneurial ventures. Our media buying experts use leading DSP’s for programmatic media buying, native advertising platforms, social media, and paid search. Our media professionals consistently out-perform major, global media agencies. Why not test our media buying team against your current media buying team provider to compare cost-efficacy? ExDigita’s AdOps professionals are experts in setting up and managing retargeting (remarketing) campaigns. We have broad media reach across multiple major media platforms and exchanges to run effective retargeting programs. Or, if your company has its own media accounts, you can have our experts manage your retargeting campaign for you. Our research team helps clients on many types of projects, involving online research and outreach by email and phone calls made by our experienced callers. Our research team develops B2B sales prospect lists with accurate, detailed contact info, and generates viable sales leads at a lower cost than advertising. We have much experience and expertise in finding and recruiting tens of thousands of affiliates and influencers for digital agencies and leading brands. We provide on-page (organic) and off-page SEO services, including page optimization and SEO-friendly content writing. Businesses need to have an active social media presence to be competitive. ExDigita can cost-effectively create and maintain a company’s pages in all major social media. Google Tag Manager (GTM) is free to use and provides many significant benefits, with full control over how your tags are defined and fired. GTM works with all Google platforms and many third-party tags. As a Google Partner, ExDigita has trained experts who can help leverage the power of Google Tag Manager. Our Creative Services team does quality video editing at very low costs for clients around the world. ExDigita has developed or co-developed dozens of web sites. We have a talented team of web developers and designers who create quality web sites and provide robust programming work for our clients. We also help clients revise, fix, and expand existing web sites. More details and examples of our web development work can be seen here. Most web sites need to be monitored daily from both the front end (user) and back end (admin). Are there obsolete or broken links? Are all scripts working properly? Are any Word Press or plugin updates necessary? How is page load speed? Are images optimized and the number of server calls minimized? Are users seeing error messages? Is all content displaying properly? Is the site’s responsive design working properly to correctly display the site on various types and sizes of devices, and various screen resolutions? ExDigita handles clients’ web site monitoring and maintenance needs reliably and cost-effectively. Why not let our trained staff monitor you web site, so your team can focus on other priorities? 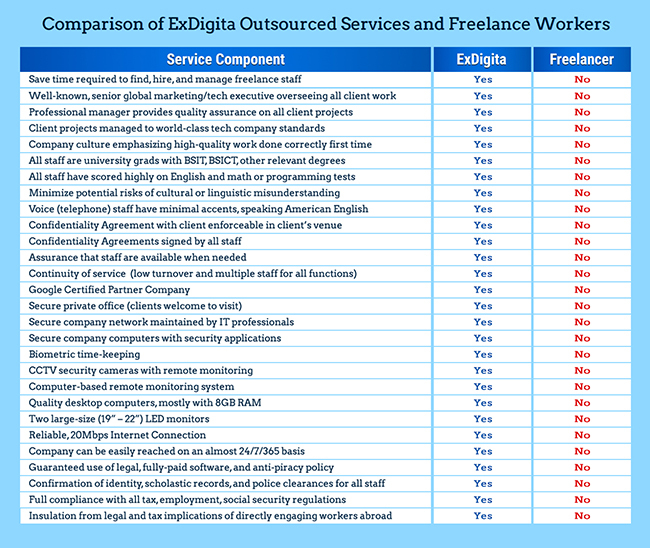 The above are just a few of the many outsourced services offered by ExDigita. Q: Frankly, we are concerned if we could adequately and effectively manage someone located thousands of miles away from our office. A: Your technical people probably work in different parts of your office or building already, some may work in different branches or satellite offices, and some might work at home. You are likely communicating with them by chat, IM, text, phone, and video conferences. It’s no different working with technical staff supplied by ExDigita. Q: How can a virtual staff member located in another country effectively communicate and collaborate with team members, and how can they be properly supervised? A: Tech staff in most companies communicate among themselves and with internal and external customers digitally more often than in face-to-face meetings. There isn’t any significant difference doing an IM chat or Skype call with someone in the next office or in an office in another location. Virtual staff can join team meetings via Skype or other conferencing apps. Q: What assurances do we have regarding the quality of ExDigita’s services? What if we’re not satisfied with the quality of ExDigita’s services? We don’t want to make a major commitment without first being able to evaluate the quality of work. A: We can talk about the experience of our management team, their various successes managing technical projects, etc. But we fully understand that, ultimately, what you care about is getting high-quality technical work done, on time, with the cost savings we promise, and with no hassles. So give us some test tasks or a small project to see if our work satisfies your needs. Q: Can’t we save even more money hiring freelancers in PH or elsewhere directly? What value does ExDigita add? It might be instructive to consider some of the many important differences between using freelancers and using outsourced services. We have summarized some of these differences in the table below. Some of our prospective clients are very surprised when we inform them of the differences between managed outsourced services and using freelancers. For example, in some countries with many freelance technical workers, it is common for freelancers to use pirated software, and to work in Internet cafes or on home computers shared by many family members. Security of client data may be lax or nonexistent, and confidentiality of client data may be compromised. It is very important to consider that somebody in a client company has to actively manage freelancers, and this can take a significant amount of time. Suppose a freelancer charges $5 per hour, with someone in the client company acting as supervisor, manager, and QA. If, for every 20 hours of freelancer work, a client uses one hour of time to manage a freelancer, and if the client’s time is worth $80 / hour, then the actual gross cost of a freelancer would be $9 per hour ($5 + $4). This is about the same hourly cost for some fully-managed outsourced technical services. Thus, in fact, the actual gross cost of using freelancers may, not be less than using fully-managed outsourced services. Significant, immediate benefits can be achieved through outsourcing technical services. Reduce Compensation Costs by 80% or More. ExDigita’s technical professionals typically cost 80% less than equivalent staff in markets like the US, CA, EU, and AU on a total annual expense basis. This 80% in typical savings doesn’t include recruitment, relocation, management, or training expenses. So actual total savings are likely to be more than 90%. Let your competitors bid for high-priced local market tech talent while you get equivalent work done at cost savings of 80% or more, while also saving on rent (fewer on-site employees), IT equipment and other expenses that increase with on-site head count. The huge savings achieved through outsourcing technical work can be invested into other areas that grow your business, such as marketing, R&D, sales staff, etc. Saving on technical work can help your company grow top line revenues. Using outsourced technical staff often enables companies to focus on their core competencies. Technology changes quickly, and your technical staffing needs can also change quickly. Outsourcing technical work helps convert fixed costs into variable costs. Pay for what you need, when you need it. Avoid the expense, potential legal risks, and bad PR of layoffs and downsizing. Most smaller businesses can’t afford to compete with larger competitors using the same staffing strategies and tactics. Smaller businesses need to work smarter and get more out of their relatively limited budget. Outsourcing helps small companies be more competitive by giving them access to technology staff and expertise that they might otherwise not be able to afford. It might not be practical for a smaller company to hire a full-time Web Programmer or AdOps professional. But it might make a lot of sense for them to engage such a person for a certain number of hours per month via outsourcing. Is your company interested in realizing the benefits listed above? The Philippine IT-BPO sector grew to US$22.1 billion revenue in 2017, with 9.6% growth year on year. Philippines is ranked 14th in English proficiency globally, while India is ranked 28th.